Scholarships are awarded to youth in Haiti to attend college in the U.S.
Preparatory programs in Haiti to maximize development and selection. Independent scholarship committee selects top candidates. Scholars from Haiti attending U.S. colleges, performing at 3.5+ GPA. Graduated three scholars – one scholar at Harvard graduate school. The support of friends like you made this possible. Thank you for your on-going donations that permit future programming (donate now). Language exchange program, founded in partnership with youth leaders in the U.S. (Coral Reef H.S.). Student dialogue and partnerships in English and French – high school age range. (on-line). Prepares youth in Haiti for TOEFL test taking, receipt of scholarships, and all other awards. Lifeline – helped youth in Haiti come back to school quickly following earthquake. The 7th session starting Fall 2011. The support of friends like you made this possible. Thank you for the on-going donations that permit future programming (donate now). Laptop computers and learning kits provided to youth groups. Students learn English and technology on computers. TOEFL test preparation. Youth Leadership Training. A special thank you to Dell Computers for the donation of computers. 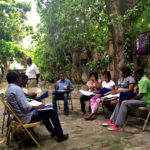 Select summer programs have been held in Cap-Haitien, hosted at the Dr. Luc L. Colas Institute. Classes focused on English learning using traditional and innovative models. Most recent program applied performing arts to accelerate English learning. Student participants exceeded all targets. A special “thank you” extended to college intern Bijou who designed and taught the classes.